IDENTA LC Posterior Fill Flow is a radiopaque, light-curing flowable composite. In contrast to conventional flowables, it is characterised by an increased depth of cure while at the same time showing reduced shrinkage stress, which means that it can be cured in layers of 4 mm thickness. When used as a base/liner IDENTA LC Posterior Fill Flow has to be overlayed occlusally with an at least 2 mm thick surface layer of a methacrylate-based universal /posterior composite. 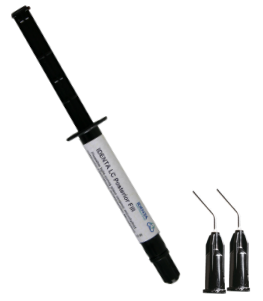 IDENTA LC Posterior Fill Flow is used with a dental adhesive. IDENTA LC Posterior Fill Flow contains 75 % w/w inorganic fillers in a methacrylate matrix.